On January 10, 1990, Premier Li Peng announced in a televised speech that Beijing's martial law would end from the next day. 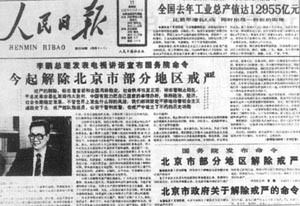 The martial law was imposed on the night of May 19, 1989, also announced by Li Peng in a televised speech. A few hours later, the American government announced that they would no longer prevent the World Bank from issuing loans to China, an economic sanction imposed after the massacre.